I am often asked about the literacy of my children. Many of you may notice that we’ve always got a book or fifty piled high from the library. 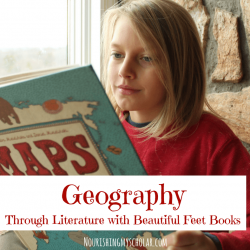 My kiddos LOVE books, and I love nothing more than snuggling up with them and reading aloud. 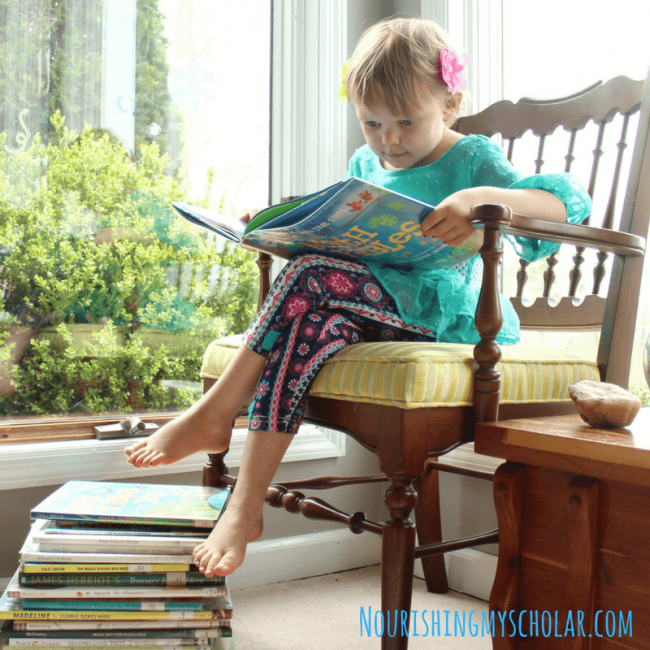 There are many things I do to promote reading literacy at home but for my daughter, we are also using All About Reading. *Disclosure: This post may contain affiliate links. Please read my disclosure statement for more information. I received All About Reading: Level 1 at no cost in exchange for a review. A positive review was not required. As always, all thoughts and opinions are my own. I only choose to share resources that I would use with my own family and those that I believe other families will enjoy and benefit from. I read to my children All. The Time. And I’ve done so since they were wee little things. It’s just a part of our family culture. We also listen to loads of audio books, use closed captioning on our television, and label items all around our home. Still, we have a very smart, creative, and super visual 5-year old that wanted reading lessons. Imagine my shock when she blew through the All About Pre-Reading in just a couple of months and is now halfway through All About Reading Level 1. Folks, my daughter LOVES her reading lessons and that’s a fact. 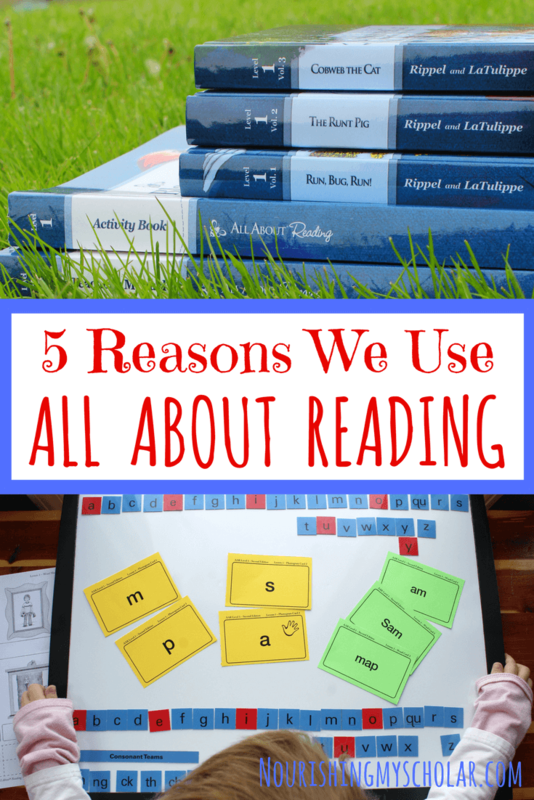 So here are 5 reasons we use All About Reading in our homeschool. 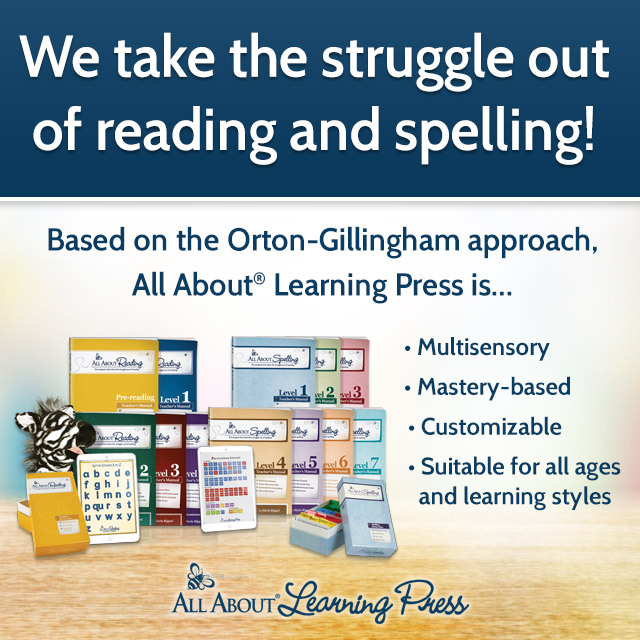 All About Reading Level 1 offers a multi-sensory approach that encompasses sight, sound, and touch. 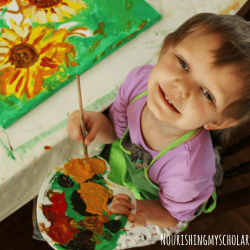 This means that our daughter finds each lesson interesting, exciting, and engaging because she gets to use all her senses. There is no bribing to do reading lessons around here. Reading is presented as a wonderful thing. Kinda like dessert! I know this falls into the multi-sensory category, but I think it needs a category all its own. GAMES. 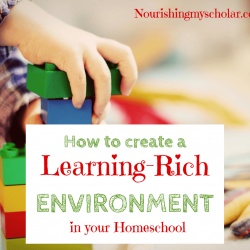 One way to motivate hands-on learners is through games. My daughter adores the games throughout All About Reading. Most are super simple. Like feeding a paper monster words from a current lesson or matching ice cream scoops that rhyme. It’s all fun and games! Plus, games stick with you. She remembers many lessons later because of the games she’s played. 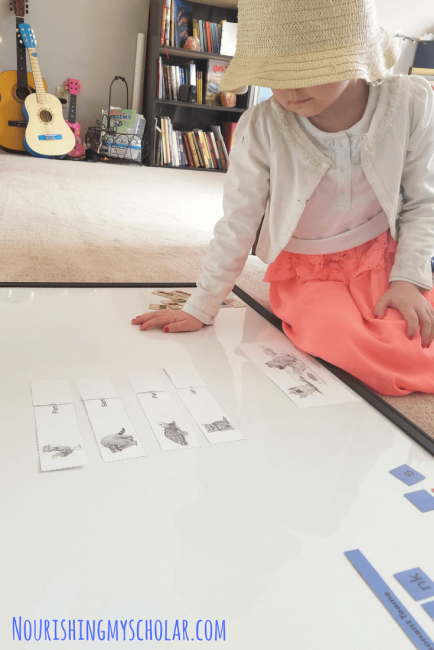 Letter tiles, flash cards, and reading activities keep our daughter motivated and engaged. 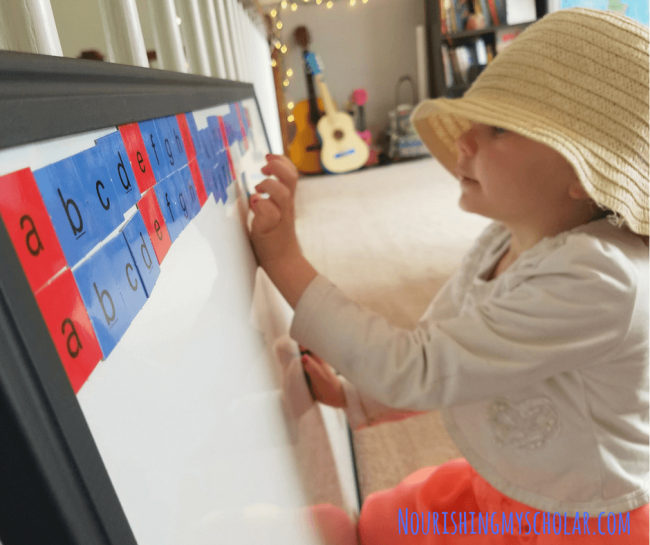 The colors stand out and make an impact on her letter board. Reviewing letters and words in different ways encourages her. 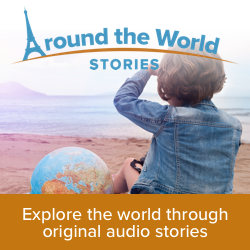 All About Reading also has cool new Phonogram Sounds App and Letter Sounds A to Z App for use on tablets and computers. I am going at my daughter’s pace of course. Some lessons may take a week to finish. Other lessons are over quick as a flash and then she wants to continue to the next…. I love that All About Reading is lightly scripted. I can use this scripting if I want or not at all. But it’s good to have extra tips and notes to help get you through some of the trickier parts of the English language. Plus, you don’t have to stress about what to teach next. Everything is laid out for you, step by step. There are no gaps. New concepts build on previous ones. The heirloom quality readers are simple but engage my daughter’s interest. They are short stories with adorable illustrations. 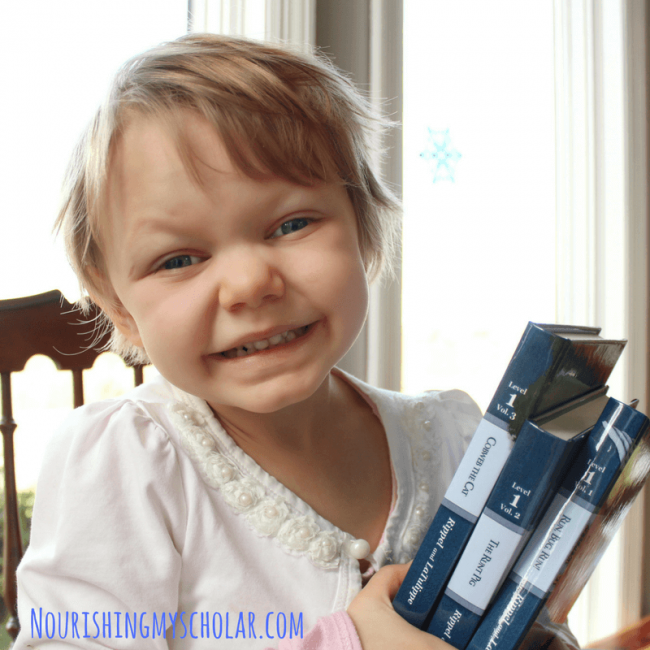 The idea of applying her knowledge to one of these stories thrills her because she is reading REAL books. 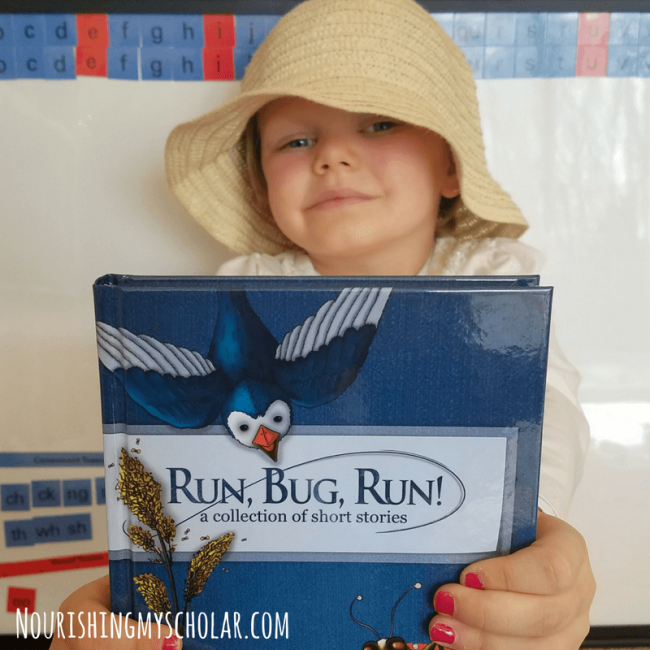 She was so excited to read the first story in her level one book, “Run, Bug, Run!” and the excitement has continued from there. 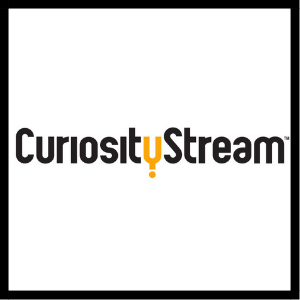 If you are interested in All About Learning, you can visit them online. 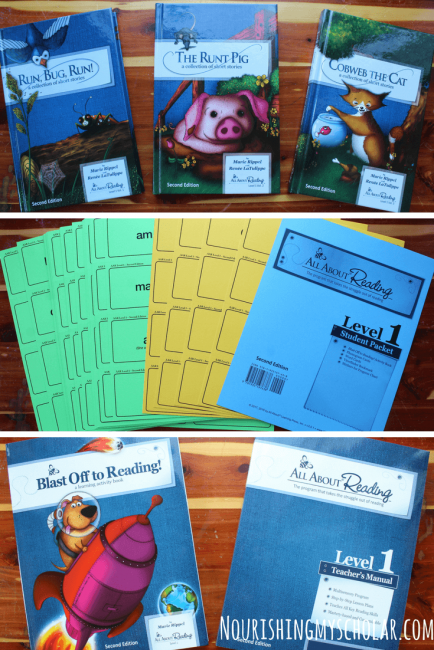 They offer reading curriculum for pre-readers through level four. The spelling curriculum is to be used after a child completes All About Reading Level 1. They also offer placement tests so that you’ll be sure to get the best level for where your child is on their learning journey. Did you know that All About Reading offers lifetime support and a one-year money back guarantee? You have a full year to try out All About Reading or All About Spelling. If you find it doesn’t meet your child’s needs, simply return your materials for a full refund! 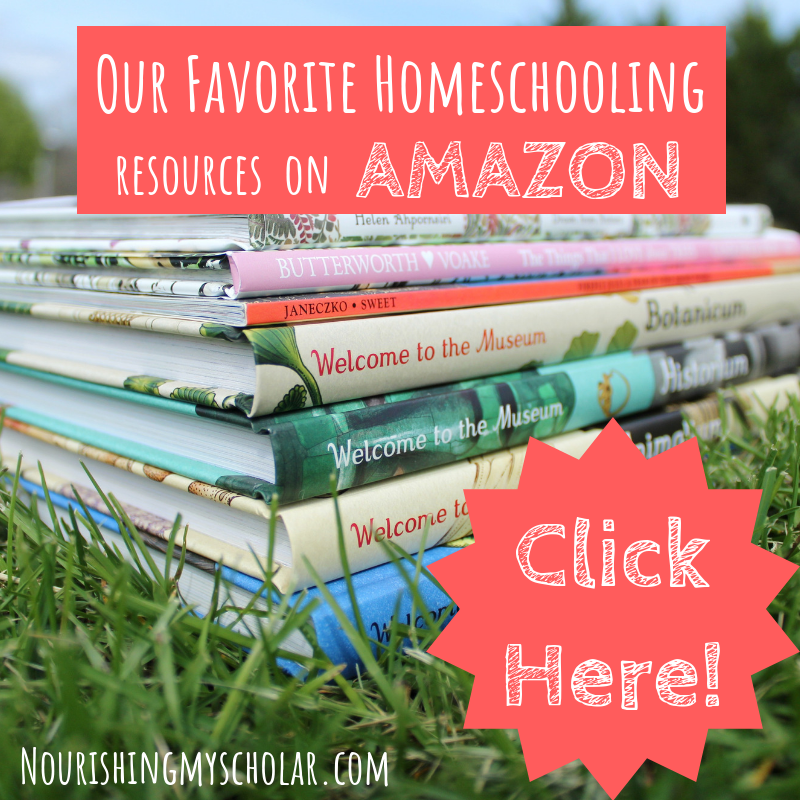 Tell me, do you use a reading program in your homeschool? 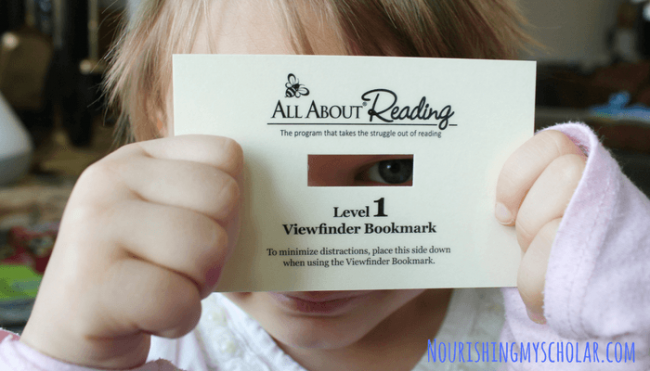 We’ve used AAR since the pre-reading level and now we are at Level 3 (also using level 2 for AAS). 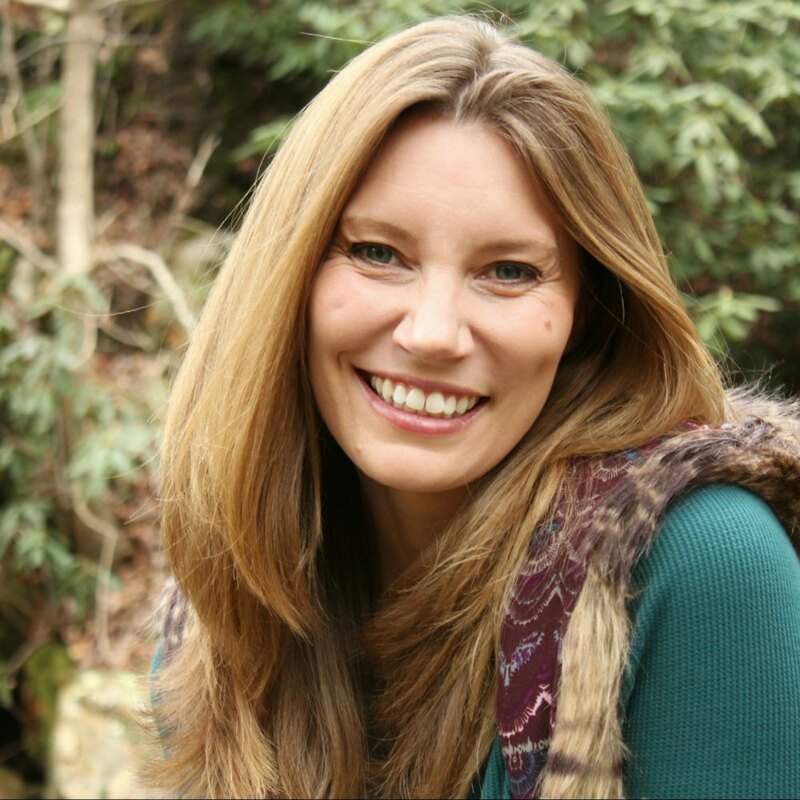 My older daughter has Aspergers and severely struggled in reading while my son was able to read right off the bat. She is finally gaining some confidence in her reading and I attribute it to AAR’s slow methodical teaching method. My active son enjoys the games and even though Ziggy the puppet from the pre-R days isn’t around in level 3, he still makes appearances and gives the game instructions. It is usually the highlight of our lessons for the day. He also makes appearances if the kids need extra help getting through long practice sheets. Simply put, I can’t sing their praises enough!! My kids are learning to read and having fun too! This is so wonderful to here!!!! I just love her expressions and faces in all these photos; you can tell she’s really having a great time. 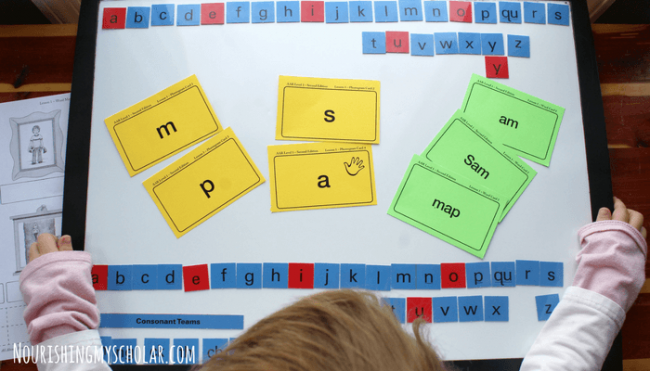 We just bought All About Spelling to use my youngest who is still struggling with putting letter sounds together in his writing and so far I love the program. I just bet their reading program is great too. Pinned. She is having fun! That’s what’s so great! My son uses and LOVES All About Spelling. 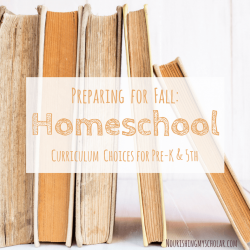 Both programs have been absolutely wonderful for both of my kiddos.